As the electricity grid around the world becomes smarter over time, complex electronic designs are necessary. At the same time, long-term system reliability cannot be compromised. A smart e-meter monitors various system voltages to prevent unexpected conditions that cause inconsistent measurements or system failures. The generic e-meter application shown in Figure 1 consists of several blocks that work together to measure consumed electricity. 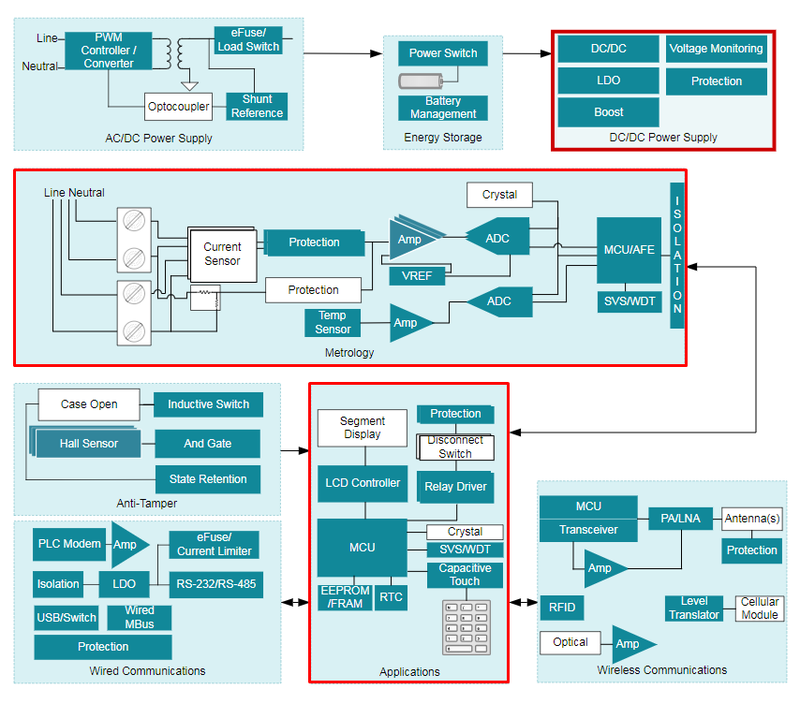 This post explains the purpose of the DC/DC power supply, metrology and applications blocks (outlined in red) and dives deep into the importance of the supply voltage supervisor/watchdog timer subsystem. From a general design perspective, a system that monitors electricity consumption needs to be precise, compact and reliable. An e-meter typically receives 12 V to 24 V from the main AC power supply before converting it into a 3.3-V or 5-V DC voltage to power the rest of the system. A voltage supervisor ensures that the main power supply and all power rails are within the system requirements so that the system operates correctly. If the voltage in this block fails or browns out, the voltage monitoring solution needs to flag the fault condition so that the rest of the system can shut down properly. If the main power supply does not provide enough power, a switch will connect a backup battery or supercapacitor into the system to provide the required power temporarily. In general, systems that rely on backup power reserves can benefit from any power savings in such critical operating conditions, since lower-power systems will last longer on the power reserves. The DC/DC power-supply block requires a voltage supervisor that has a wide VIN to monitor up to 24 V, and low power when using the power reserves. The metrology block connects to the outside world through sensors, and is responsible for the actual electricity measurements before sending the information to a microcontroller (MCU) for processing. The applications block has another MCU that formats and stores data in addition to displaying information. This block is responsible for monitoring the whole system and serves as the main interface between the system and the data output. Accurately monitoring the voltage rails powering the MCUs and MCU activity is critical in these blocks to ensure reliable and consistent measurements. If the MCU is not in the correct operating condition, a voltage supervisor or watchdog timer can flag a fault before any other issues arise. When monitoring a voltage, specifically in a system that requires precise, robust and reliable measurements, voltage monitoring accuracy is important to determine quickly and exactly when the system is not functioning at optimal performance. Additionally, whenever an application uses an MCU or several different peripherals, there may be the need for programmable startup delay for sequencing purposes. Programmable delay serves an important function when the MCU or other peripherals need a specific amount of time to boot up or to accomplish a task before the system can begin functioning normally. Also, when a fault condition occurs, there may be a need for a specific reset delay for the MCU and/or peripherals to accomplish a task before releasing the reset. In this case, the programmable delay feature provides a programmable and simple solution to add flexibility. All three of the blocks outlined in Figure 1 require voltage supervisors with a wide VIN, low power, high accuracy and programmable delay. A good option to consider is the TPS3840, as it offers a balance of these requirements in one device. The TPS3840 has a wide input voltage range up to 24 V or higher with external resistors for monitoring the high- and low-voltage rails, 1% typical voltage monitoring accuracy, and only consumes 350 nA of power while offering programmable delay. In addition, the TPS3840 provides significant precision and flexibility that is not obtainable with internal analog-to-digital converter monitoring in the MCU alone. Compared to the internal ADC monitoring in the MCU, the TPS3840 has more flexibility in the voltage monitor threshold options, a lower power-on-reset voltage and a quicker startup delay. Power-on reset is defined as the minimum input voltage before the output becomes defined, which is essential for preventing glitches that can produce false faults or premature system startup. The startup delay for the TPS3840 is only 220 µs, meaning that the TPS3840 can begin monitoring voltage before the rest of the system even powers up. Overall, voltage supervisors ensure proper system functionality by continuously monitoring the voltage rails going in to power the internals of an e-meter. An external watchdog timer in both the metrology and applications blocks will ensure that the MCU does not latch or glitch periodically by detecting pulses sent by the MCU’s general-purpose input/output pin. If the software glitches and a pulse is missed, the external watchdog timer will reset the MCU. The TPS3430 programmable watchdog timer is a good option since it offers programmable watchdog timeout and watchdog reset delay to meet the timing requirements of any MCU. If you need both a voltage supervisor and watchdog feature, TI has many devices that fit this need. Review the “Voltage Supervisors Quick Reference Guide” under the Supervisor + Watchdog Timer heading for all options. See all of the voltage supervisors TI offers. Download the TPS3840 data sheet. View the TPS3430 data sheet.